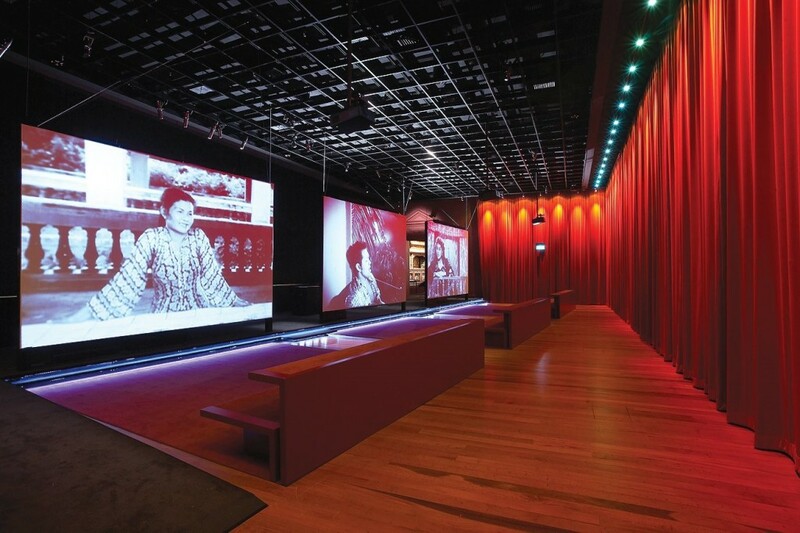 In the year 2006, the National Museum of Singapore Film Gallery commissioned Singaporean filmmaker Royston Tan to produce a montage sequence from archived footage of Malay films produced during what was known as the Shaw-Cathay-Keris studio era. This sequence would form the centrepiece of the Film Gallery, one in a series of four ‘Living Galleries’. ‘Singapore culture’ is a widely contested term, reflected in literary, sociological and historical scholarship. The term ‘Singaporean’ itself is more securely employed to describe one’s citizenship status, rather than national identity. The main articulation of Singapore’s culture, at least in official discourses, is ‘multiculturalism’, codified by the state into a typology recognizing four ‘official races’ comprising a ‘multiracial society’:the Chinese, Malays, Indians and Others. In conceptualizing the ‘Living Galleries’, the museum has harnessed this multiracial trope to represent ‘Singapore society’. In the Fashion Gallery are displays of the Chinese cheongsam, the Malay kebaya and the Indian saree. In the Food Gallery, street hawker fare becomes racial signifiers: noodles for the Chinese, satay for the Malays and roti prata for the Indians. The Photography Gallery showcases photographs from family albums belonging to different ethnic communities. The Film Gallery, however, presented a challenge to this mode of classification. 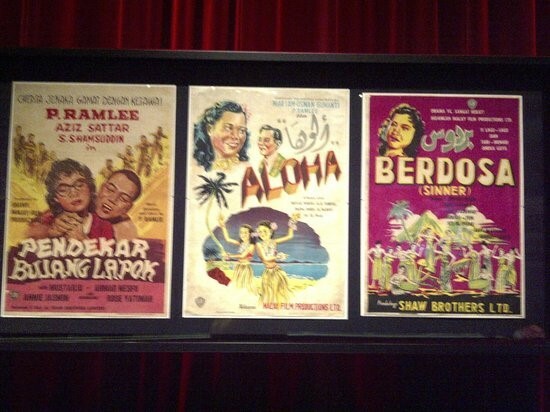 The films produced during the ‘golden age’ of studio film production in Singapore, periodised as the years between 1955 and 1965, were overwhelmingly Malay. They featured Malay actors, speaking the Malay language, in plots often adapted from Malay histories and legends. As a matter of fact, the only Chinese film made by a local studio during this period was Cathay-Keris’ ‘LionCity’, released in 1960. This might explain the presence of a ‘Wayang Gallery’ within the Film Gallery itself. Wayang is the vernacular for Chinese street opera, a theatrical performance form involving elaborate costumes and makeup, stylized gestures and singing styles, and a standard traditional repertoire. It is usually performed in conjunction with religious festivals such as the Lunar 7th Month. The ‘Wayang Gallery’ carried displays of a puppet theatre set as well as spectacular Wayang costumes and props. However, Chinese street opera has its Malay counterpart in the Bangsawan. For curatorial coherence, paraphernalia from both forms could have been exhibited under the category of ‘Theatre’ or ‘Performance’. In fact, the latter term might have allowed the gallery to also include accoutrements from performance forms as diverse as Indian Bharatanatyam, a dance often performed during religious festivals in Hindu temples. This would have allowed the gallery to conform to a standardized and inclusive multicultural script. Nevertheless, there were artifacts which aimed to mitigate the seemingly monoethnic character of the cinema section. An exhibit of film star memorabilia included a tray bearing the image of Hong Kong actress Lin Dai, film entertainment magazines written in Chinese, as well as trading cards with portraits of Hollywood stars. However, these were more representative of patterns of consumption and fandom of imported cultural products, rather than the output of the local film industry. The latter remained predominantly, stubbornly Malay in character. While the Film Gallery might present a narrative of the history of film in Singapore, the films also present what could be called a history in film. While narrative is often foregrounded in these films, involving audience identification with characters and investment in plot developments, it is the ‘background’ which invites retroactive analyses by contemporary viewers. The various details in the mise-en-scene, such as the setting (especially location shots), the fashions (hairstyle, dressing), the speech patterns and mannerisms, the furniture, the modes of transport, builds up one’s understanding of a certain socio-cultural milieu. What served as merely window-dressing in a frame ultimately becomes a window to the past. The Malay films were screened throughout the Malay Peninsula, and to a lesser extent, Southern Thailand and Indonesia. Their market did not solely depend on the island’s population. The films were addressed to a Malay-speaking public, and reflected a growing consciousness of their historical past as well as the first stirrings of a decolonized imagination. The former was portrayed through the cinematic adaptations of stories from classical texts such as the Sejarah Melayu (for example, Singapura Dilanggar Todak and Hang Tuah), and the latter through gradually insistent calls for creative control to be transferred from Indian to Malay directorial hands (a feat P. Ramlee achieved with Penarek Becha in 1955). It is illuminating that Mohd Zamberi has referred to the Peninsula as the ‘mother land’. The Peninsula consisted of Melaka, the cradle of Malay civilization and sovereignty, the expansive rice bowls of Kedah, the coastal and interior rural populations of its other states. Singapore’s connection to this hinterland depended on its status as a site of modernity—unlike many Malay states, it was free of feudalistic baggage. Its status as a free port also meant that it was extremely porous to globalizing influences and new technologies. Singapore existed in a symbiotic relationship with this ‘mother land’/motherland: its films drew sustenance and inspiration from the cultural repository and the talents of the Peninsula; on the other hand, its film studios in Singapore (and their vertically-integrated branches) provided the infrastructure for the actual production, distribution and exhibition of films. In 1967, Shaw closed down its Malay Film Productions Studios in Jalan Ampas. Cathay was to follow suit five years later. The decline of the Malay film industry coincided with the period subsequent to the expulsion of Singapore from the Federation of Malaysia in 1965, and the subsequent marginalization of the Singapore Malay community. British withdrawal from the naval bases, as well as the Singapore government’s decision to retrench and restrict personnel in the uniformed services, resulted in widespread unemployment for the community. Malay, while retaining its politically-expedient status as a national language, was displaced by English as the country’s lingua franca. With the separation from Malaysia, Malays in Singapore found themselves transformed overnight from a majority to a minority constituency, with diminished political influence. Unlike the Chinese and Indians, the Malays in Singapore have never considered themselves to be immigrants. Even if they had traveled from the Peninsula or the Indonesian islands to Singapore, the passage was often conceived of as internal migration within a Malay archipelago which they considered home. The cultural orphanage for Malay Singaporeans was not during the colonial period, but began with Separation in 1965. The splitting of talents and facilities across the Causeway that occurred at the twilight of the Malay film industry represented an infrastructural disintegration of cinema, as well as the dis-integration of the Malay cultural psyche. In 2002, Royston Tan, one of the most acclaimed Singaporean filmmakers of the 1990’s ‘revival period’ (Uhde, 2000), released the short film ‘Mother’. Considered one of his best works, it was ironically assembled from ‘found footage’ from the private collection of a ‘Mr. Pereira’ (credited as Director of Photography). ‘Mother’ consists of stock 8-mm footage showing scenes of a Eurasian family, overlaid with music and a Mandarin voiceover. The footage is composed of grainy, faded, hand-held shots, commemorating the various stages in the life of a family: excursions, birthdays, gatherings, travels. What is most arresting about the footage is how it captures a Singapore in the 70’s and early 80’s, with the fashions, architecture, landmarks, and the product designs (automobiles, tricycles, swings) of that period. The Mandarin voiceover, according to Tan, was scripted after an interview with a prison inmate. It expresses the bitterness felt by the narrator towards his mother, the malevolent shame he felt at what he perceived were her naiveté, her shabbiness, and her clumsy attempts at consolation. Near the end of the narration, however, hatred turns to remorse. An attempt at reconciliation turns out to be futile, as the narrator visits his old house and realizes that his mother has departed. The juxtaposition between the visuals and the voiceover strikes one as jarring at first. For one thing, the narrator is an adult Chinese male, whereas the main protagonist in the footage is a very young Eurasian girl. For another, the angsty and frequently sordid tone is completely at odds with the fresh-faced innocence of the protagonist and the idyllic images of gardens and beaches. However, it is this tension that makes ‘Mother’ such a fascinating and heartbreaking film. The narrator’s story is told with a vengeful, confessional exhibitionism, with multiple references to his materialism and hedonism. It is inherently brutal, but the violence is further underlined by the contrast with images of childhood and familial gentility. It is also an ingenious instance of self-reflexivity, because the filmmaker’s attempt to affix meaning and narrative to the images is also an act of hermeneutic violence. It is tempting to perform a productive intertextual reading of Tan’s ‘Mother’ and the Film Gallery montage. The parallels are evident: both projects involve stock footages: one of a family’s private memories, another from the Shaw Brothers Malay Film Productions archives. Both involve the same filmmaker editing the footage to create a new work. The beginning of ‘Mother’ begins with the line: ‘I ran away…to start my life again…without you.’ This is a sentiment similar to that of Singapore as a prodigal son, addressing the maternal Peninsula post-Separation. However, the comparisons end here. In ‘Mother’, the footage was obtained from the personal collection of the Pereira family. The Malay films, however, have entered public consciousness as a kind of ‘cultural memory’ for the Malay community. In addition to the narratives of loss inscribed in them, they also contain certain scenes and dialogue fragments that have achieved iconic status. The recognition of these scenes is not restricted to the cinemagoers of the 50’s and 60’s, but extends to younger generations of Singapore Malays as well. The “ratings of old P. Ramlee films…is very high” (Uhde, 2000, p. 10) on Singapore television, and many of these films are regularly screened on special occasions such as Hari Raya. Television, which was partly to blame for the demise of Malay cinema, is ironically ensuring its posterity. The popularity of these films is demonstrated by youngsters quoting verbatim dialogue from the films and the number of clips extracted from these films that are posted on video-hosting websites such as YouTube. Tan has admitted to being unfamiliar to most, if not all, of the films of the ‘golden age’. In addition, many of the films he watched did not carry English subtitles. As such, he has adopted a formalist approach to the montage in the Museum’s Film Gallery, relying on visual matches to link scenes. He has also retained the soundtrack to the scenes, rather than overlay additional music or voiceovers as he had done in ‘Mother’. For the Film Gallery project, Tan worked with three screens producing a triptych in the form of a film installation. The montage begins with a shot of the moon, which is “associated with love and provides a link between absent lovers in Malaysian and Indian cinema.” (Van der Heide, 2002, p180). The voice of P. Ramlee, the most popular legend of Malay cinema, is heard. 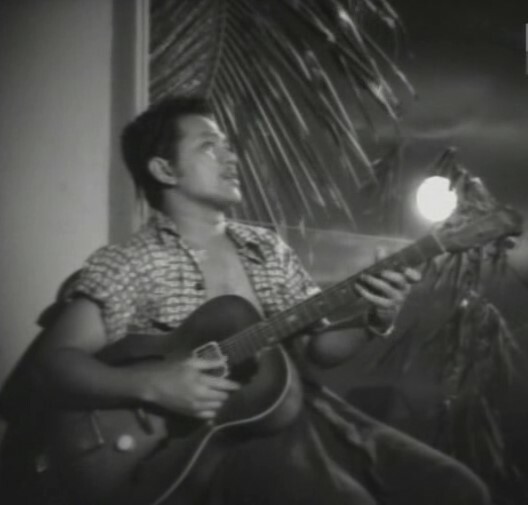 He is singing the first verse to the song Nak Dara Rindu, a lovelorn lullaby, from the film Bujang Lapok (1957). It begins with the line ‘Di waktu malam, bulan mengambang’ (In the evening, the moon is waxing). Shots of children are seen next, as if responding to the summons of his song; these scenes are from Anakku Sazali (1956). P. Ramlee is then shown strumming his guitar while sitting on a window sill, in the centre screen. On the left and right screens, various other actors make their appearances, enthralled by the music: Zaiton opening the window, Aziz Sattar moony-eyed, Normadiah peeping from behind a curtain, Saadiah enraptured, Sarimah in a swoon. From Anakku Sazali, we see the montage of posters with titles of cities like ‘Penang’, ‘Ipoh’ and ‘Taiping’, which in the film announced the pan-Peninsular popularity of the saxophonist Kassim Selamat, but which in the context of the montage signified the widespread appeal of Malay films. The moon is shown again, but this time from the film Sumpah Orang Minyak (1958). As a signifier, it has shifted from connoting romance to horror. Scenes from the film follow, which includes the bunian (spirit) procession, Si Bongkok’s confrontation with the devil Shaitan, and villagers terrorized by the eponymous character. Amidst screaming, the scene shifts to footage of World War II from the film Matahari (1951), about a resistance heroine played by Maria Menado. There are shots of aeroplanes flying, rubble and explosions. Lightning sears the sky, and another explosion occurs in a cemetery, resurrecting the pontianak in Anak Pontianak (1959). We witness scenes of the transformation of Hashimah Yon into the pontianak, the mad scientist Haj Sattar into a deformed beast, and Jins Shamsuddin’s hands into hairy claws. A struggle occurs in Anak Pontianak, which then segues into a scene of two men wrestling in Hang Tuah (1956). Its climactic scene is shown, where Hang Tuah challenges Hang Jebat to a duel. This is followed by the strains of the song Joget Pahang with P. Ramlee singing and dancing the joget with the cast of the Melaka court. Hang Tuah gradually becomes colorized (the original was in colour, but it was decolorized by Tan for the montage). The left and right screens show other dance sequences, from films spanning three decades: Cinta (1948), Ribut (1955, Shaw’s first colour film), and Raja Bersiong (1967, Shaw’s last film, also in colour). The montage ends with P. Ramlee and Zaiton gazing at each other in the centre screen, with Ahmad Mahmud and Saadiah, in two different shots, occupying the flanking screens. Tan has used non-diegetic links to stitch the scenes together, ranging from visual matches (the moon, the explosion, the physical struggle), to thematic relationships (the war and horror genres). In addition, the triptych format allowed for some inventive editing, such as a bunian chariot (from Sumpah Orang Minyak) traversing across all three screens, and an image flashed in succession from one screen to another, to conjure the illusion of movement (rhythmically matched with a shot of P. Ramlee’s hand playing the guitar). The end of the montage is probably where the editing was most experimental: on the left screen, the image was upside-down, with the border visible between two ‘film frames’. Also, the ending of the line ‘Bagus Hang Tuah!’ (Well done, Hang Tuah!) at the end of the Joget Pahang, was echoed repeatedly. By suggesting a malfunction in the projecting apparatus, as well as conjuring the sensation of a final line uttered in a cavernous and empty cinema hall, Tan subtly signaled the eventual decline of Malay cinema and the end of an era. The selection of the types of films to be incorporated into the montage invariably involved exclusions. The two gaps between the three screens was itself a reminder of those scenes that were left out of the final cut. M. Amin has identified eight genres of Malay films, which he classifies as folk stories, social realism, feudal critiques, legends, community stories, comedies, religio-didactic films and horror (M. Amin, 1998). Of these, the ones which have had most enduring appeal for contemporary Malay viewers are the comedies, especially the Bujang Lapok series, starring P. Ramlee, Aziz Sattar and S. Shamsuddin. But comedy poses a few problems for inclusion in the montage. 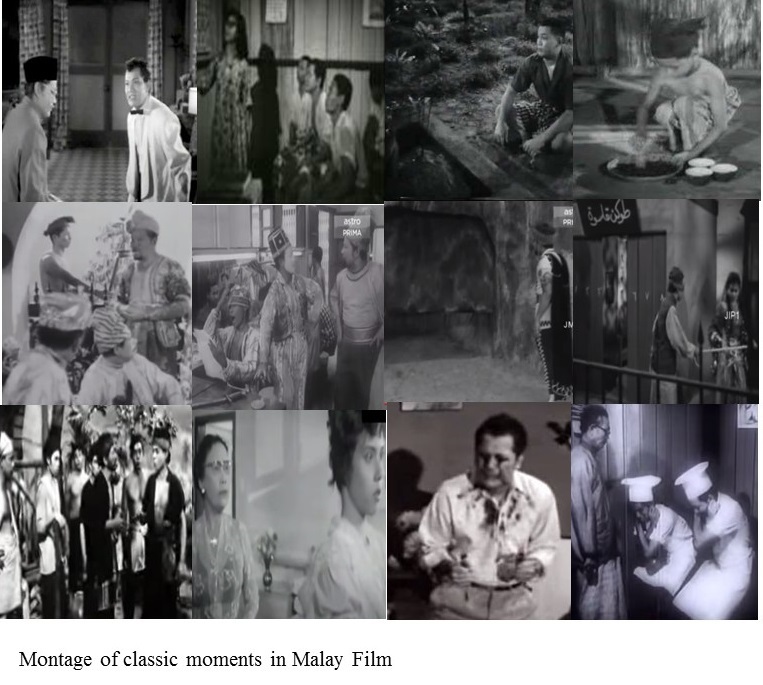 Much of the humour in ‘golden age’ Malay films was verbal in nature. Subtitling the dialogue into English might have been one solution, but humour can be intransigent to translation. The use of subtitles would not have helped for they would have been difficult to read, given the space separating the three screens. Subtitled scenes would also have restricted editing possibilities. Humour particularly in the form of hilarious banter require a lengthy set-up before the punchline. Tan’s montage sequence featured two songs and five instances of brief dialogue. None of these was comic lines. The omission of comedies however, did not mean that there was no humour present in Tan’s triptych. Tan’s audience would find the use of jump cuts to denote human-to-monster transformations, as well as crude latex makeup that seemed more comically grotesque than genuinely terrifying. Production design was also an occasion for laughter, with the tacky bunian chariot and obvious studio sets with painted skies. Furthermore, some of the acting was also exaggerated to the point of being absurdly hilarious, especially the victims in the horror films. The absence of the verbal also meant that some of the icons of Malay cinema were deprived of the very distinctive speech which was so integral to their performances and personas. We did not hear in Tan’s montage Siti Tanjung Perak and her untamable Indonesian accent, Neng Yatimah, the ‘Queen of Tears’, bemoning her fate with a broken voice, Ahmad Nisfu and his wheezing constipations, Mak Dara perfecting her evil mother-in-law role with her raspy, emasculating putdowns. In fact, none of these actors were featured in the montage. However, the genesis of the iconic depends not only on the moment of its appearance but its subsequent reproduction in popular culture—via quotation, mimicry, homage and parody. Some of the well-known iconic moments in cinema would include Buster Keaton hanging from a clock’s hands, King Kong on the Empire State building, the shower scene in Hitchcock’s ‘Psycho’ and Robert De Niro’s ‘You talkin’ to me?’ mirror soliloquy in Taxi Driver. From Anakku Sazali (1956): P. Ramlee acting both the parts of father and son, with the son claiming that his waywardness was due to the father’s neglect; from Pendekar Bujang Lapok (1959): the three bachelors learning the Jawi alphabet, P. Ramlee trying to meditate in a cemetery; from Nujum Pak Belalang (1959): Bat Latiff preparing coffee for his father from soot scraped from a wok, P. Ramlee calling out for his son when faced with a riddle; from Seniman Bujang Lapok (1961): the three bachelors in the make-up room, the three of them again on the production set; from Ali Baba Bujang Lapok (1961): P. Ramlee uttering a rude chant in Javanese to open the entrance to the cave, Sarimah leading the blindfolded Apek through the streets of Baghdad; from Sri Mersing (1961): Noordin Ahmad reciting the pantun with the haunting first lines ‘Kajang Pak Malau kajang berlipat’; from Ibu Mertuaku (1962): Mak Dara telling Zaiton that she would never let the latter marry a musician, P. Ramlee driving a pair of forks into his eyes; from Labu dan Labi (1962): Udo Omar punishing P. Ramlee and M. Zain by making them do the ketuk ketampi—squats while pulling their own ears. While someone familiar with Malay films might bemoan the absence of key iconic scenes, the decoding of these scenes would require a certain cultural capital which would not have been accrued by the majority of the target audience of the montage. My first contact with ‘golden age’ Malay films, on television, was invariably mediated by my mother. As a child, she would accompany me as we watched the films, providing a running commentary as the events unfolded on screen. In many ways, her frequent interjections emphasized the polysemy of these films. She would identify the stars in the films, and provide a biographical sketch of them. (S. Roomai Noor married Siput Sarawak and then Umi Kalthum; their children were Anita Sarawak and Noor Kumalasari respectively), as well as some comments on their star personas (Sarimah had ‘the body of a violin’, Latifah Omar’s character was invariably bullied by Siti Tanjung Perak’s, Kasmah Booty’s shoes created a whole trend of imitative footwear). She would also provide commentary on shifts in social practices and values: the 50’s and 60’s were much more liberal timeswhen women wore figure-hugging kebayas, there were references to racehorse-betting and drinking; there was more on-screen physical contact between opposite sexes. Mother’s views were commonly-held ones. A popular history of the Malays in Singapore often refers to a creeping conservatism as a result of Islamic revivalist movements in the late 1970’s. However, it is entirely possible that Singapore as an urban centre, the idealized ‘New York of Malaysia’ envisioned by the late Tunku Abdul Rahman, claimed an exceptional status for itself, as a ‘cultural outlier’, with looser codes of moral surveillance. My mother’s readings of Malay films can be characterized as ‘negotiated’, as it vacillates between an absorption in diegetic elements or the story in the film, and a critical approach to its extra-diegetic dimensions. Much of this has to do with the migration of the text from the cinema screen to television, which allowed for a more distracted, fragmentary mode of viewing, interrupted by advertisements and channel-surfing. This foregrounding of extra-diegetic codes thus prompted my mother to shift her attention to the historical, cultural and even political ‘accents’ of the films that she watched with me. The ‘absent motherland’ latent in the films was communicated to me, along with its legacy of disinheritance. My mother was born in 1951, 14 years before Separation; I was born in 1977, 12 years after. The Malay films that we watched provided a link not only between our respective generations but between two sets of histories. As I watched Tan’s montage on the three screens, I wanted my mother to watch those images by my side, to entertain my most naïve questions; not just ‘what is this story about?’ but ‘who is that?’, ‘where was this?’ and ‘why are they doing that?’. If indeed the issue is about cultural memory, then why did the museum not engage a filmmaker who is more familiar with the filmic material? Rather than condemning this as the museum’s oversight, I see the engagement of Royston Tan to create the montage as critical to the attempt to expand the definition of ‘cultural memory’. Tan was expected to create a new aesthetic product—a film installation, and not a documentary. It could not be expected that non-Malay audiences of the montage will be privy to much of the extra-diegetic subtext that my mother provided, for example; in this case Tan became the first test-audience for the filmic material. His final selection reflected the tastes of a universalized audience which lacks a culturally-informed interpretative lens. Perhaps it is time for contemporary Singaporean filmmakers to tap on the cinematic heritage of the ‘golden age’ of Malay films, regardless of their ethnic backgrounds. Tan’s approach to his material was primarily formalist and aesthetic, but when his montage shifted to colour, this not only signified the advent of technology, but also the promise of a non-monoethnic Singapore cinema. The recent donation of 90 classic Cathay-Keris Malay film titles to the Asian Film Archive carries with it the potential of restoring and perhaps distributing remastered versions. At the end of Royston’s Tan’s Mother, the narrator says, “I saw uncle. I saw sis. I saw aunt. I saw the old neighbours. I have seen all that I wanted to see. But I did not see you Mum.” The absence however need not necessarily mean death. Tan’s contribution to the National Museum Film Gallery is an attempt to ensure that Singapore cinema, after its long sleep, does not emerge an amnesiac. Ahmad Sarji. (1999) P. Ramlee: Erti Yang Sakti. Subang Jaya, Malaysia: Pelanduk Publications (M) Sdn Bhd. Barthes, Roland. (1981) Camera Lucida: Reflections on Photography.New York: Hill & Wang. Harding, James and Ahmad Sarji. (2002) P. Ramlee: The Bright Star. Subang Jaya Malaysia: Pelanduk Publications (M) Sdn Bhd. Jamil Sulong. (1990) Kaca Permata: Memoir Seorang Pengarah. Kuala Lumpur: Dewan Bahasa and Pustaka Kementrian Pendidikan. Shaw Organization. http://www.shaw.com.sg/shawstory/shawstory.htm The Shaw Organization, 2001. Film historians like Uhde and Hamzah Hussein, however, recognize that the Malay film industry was a product of a multicultural endeavour: Chinese capital, Indian directors and Malay casts. However, as this essay is concerned with the films as texts, I use the dominant language and the ethnicities of its performers to characterize the films as ‘Malay’. This film is actually quite obscure to most Malay Singaporeans, as it is hardly shown on television. Tan’s use of footage from the film in his montage might hopefully provoke research into the relationships between the ‘golden age’ films and nationalist texts. Anak Pontianak is part of Shaw’s collection of pontianak movies, which were made to rival those of Cathay-Keris. Hence they do not feature the quintessential pontianak, Maria Menado, who was a member of the Cathay-Keris stable of stars. Hang Tuah was also credited with the line ‘Tak akan Melayu hilang di dunia’ (The Malays will never vanish from the face of the earth), often appropriated by ethno-nationalists in Malaysia. In the context of the decline of the Malay film industry in Singapore, the line acquires an ironic ring. 6) Hang Jebat: Siapa nama kau? (What is your name?) Hang Tuah: Hang Tuah. Songs like ‘Di Singapura’ by Julia and ‘Cermin Singapura’ by Salbiah in the 60’s had already identified Singapore as somewhat decadent, a place where ‘youths held hands freely’ and entered ‘drinking joints’. From an interview done with Tan by Ong Keng Sen for the ‘120’ Project by TheatreWorks.